In the past decades, the damage due to natural and man-made disasters increased worldwide in amount and magnitude. According to the Munich Re Group, the year 2005 with overall losses exceeding US$ 210 billion set a new record and more than one hundred thousand people were killed as a result of natural catastrophes. 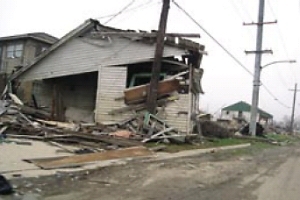 Thereof, Hurricane Katrina including the New Orleans flood in the United States was the most expensive natural catastrophe loss in history. Rapid population growth, global climate changes and the over-exploitation of natural resources are mainly responsible for this. 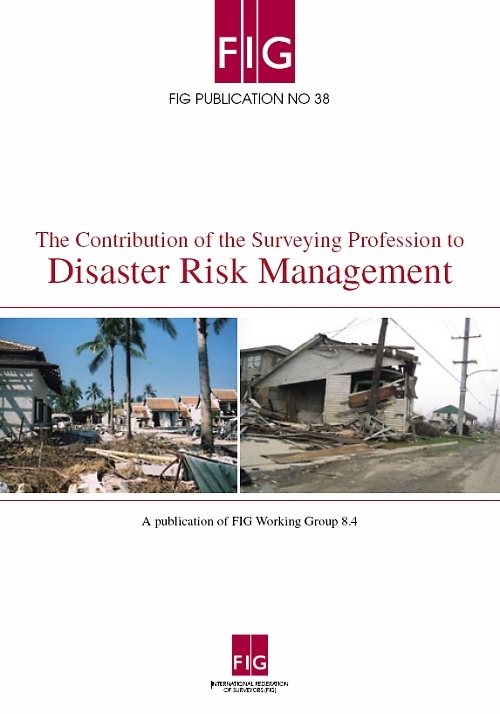 To break and, if possible, reverse this negative trend, International Federation of Surveyors (FIG) implemented a working group to highlight the current and future need for research and action in the field of disaster risk management in the year 2003. After three years of research in the form of expert meetings as well as papers and posters presented at five FIG Conferences, the present publication aims at presenting application-oriented concepts, methods and instruments for an effective disaster risk management. The report shows clearly that disaster risk reduction could (and should!) be an essential field of application for a surveyor/geomatics engineer/geodesist/land manager. The wide scope of surveyor’s abilities including land management, geodetic engineering, geo-informatics, satellite technology, and remote sensing can make an important contribution to improve, simplify and to shorten the disaster management process. In addition to these engineering skills and knowledge, good governance and capacity development are central components regarding the process and implementation of disaster risk management and sustainable development. In view of these fields of activity, FIG intends to contribute to a more sustainable and effective disaster risk management and in the long run to the success of mitigating natural and man-made disasters. I wish to thank the members of the FIG Working Group 8.4, the sister organizations of FIG and other organizations who have contributed to this publication for their constructive and helpful work. My special thanks go to Svein Tveitdal, Director of UNEP/DEC/DEPI, for supporting the FIG work and for acting jointly with FIG to make sustainable development for future generations a reality. The report summarizes the fundamental results after a three year period of work. For further information about the working group see www.isbk.uni-bonn.de/fig. This document is based on the papers presented at the FIG conferences over the last three years (Marrakech, Athens, Jakarta, Cairo and Accra). Furthermore, the keynote presentations at these conferences given by Univ.-Prof. Dr.-Ing. Holger Magel, President of FIG, have been of great benefit to this document. Relevant publications of the United Nations Environment Programme (UNEP), the United Nations International Strategy for Disaster Reduction (UN/ISDR), the United Nations Human Settlements Programme (UN-HABITAT), the International Association of Geodesy (IAG), the International Society for Photogrammetry and Remote Sensing (ISPRS) and other non-governmental organizations working in the field of disaster risk management have provided essential information in the preparation of this document. Last but not least, we would like to thank the Munich Re Group and the United Nations University, Institute for Environment and Human Security (UNU-EHS) for their support and the provision of photos. The launching of this publication took place at the XXIII International FIG Congress in Munich, Germany, October 8-13, 2006 (conference web page: www.fig2006.de and proceedings web page: www.fig.net/pub/fig2006). While many people are aware of the terrible impact of disasters throughout the world, few realize that this is a problem that we can do something about. 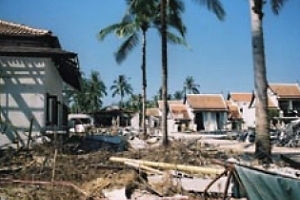 In the main part (chapter 3) the declaration provides a summary of the wide range of geodetic techniques and tools for disaster mitigation, rehabilitation and reconstruction. Especially methods and instruments of geodetic engineering, satellite geodesy, remote sensing, photogrammetry and land management can make an important contribution to improve, simplify and to shorten the disaster risk management procedure during the pre- and post-disaster phase. Section 3.6 summarizes the results, followed by recommendations as a basis for a more sustainable and effective disaster risk management process. Natural disasters are a threat to sustainable development. The people most affected by natural disasters are the poor. Any effective strategy to manage disaster risk must begin with an identification of the hazards and what is vulnerable to them. But what does this mean? What is the correlation between risk, hazards and vulnerability? 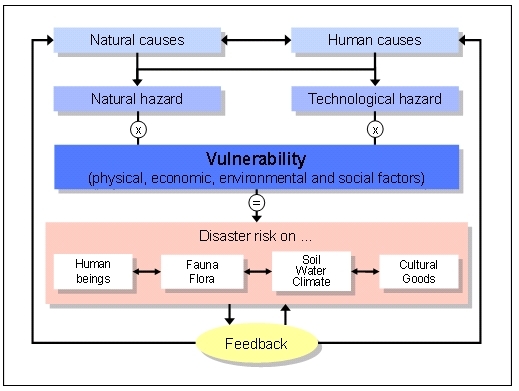 The risk of disaster is expressed by a compound function of natural hazard and the number of people, characterized by their varying degrees of vulnerability to the specific hazard, who occupy the space and time of exposure to the hazard event (see Wisner et al 2004, p. 49 and table 1). Earthquake, volcanic eruption, mass movement (landslide, debris flow, avalanche), windstorm (including tropical cyclone, tornado, blizzard etc. ), flood, tsunami, drought, forest fire. Industrial pollution, nuclear activities and radioactivity, toxic wastes, dam failures; transport, industrial or technological accidents (explosions, fires, spills). Hazards can be single, sequential or combined in their origin and effects. Each hazard is characterized by its location, intensity, frequency and probability (UN/ISDR 2004, p. 16) and might lead to a disaster. A disaster is defined as a serious disruption of the functioning of society, causing widespread human, material or environmental losses, which exceed the ability of an affected society to cope using only its own resources (EEA 2006). The extent of the disaster depends on both the intensity of the hazard event and the degree of vulnerability of the society. For example a powerful earthquake in an unpopulated area is not a disaster, while a weak earthquake which hits an urban area with buildings not constructed to withstand earthquakes, can cause great misery (GTZ 2001, p. 14). Due to this fact, hazard events are only classed as catastrophes when human beings or their property are affected. The term natural catastrophe is used when a natural event is so intense that people suffer and material assets are affected to a substantial degree and on a more or less large scale. A “great” natural catastrophe is defined by the United Nations as a natural catastrophe that distinctly exceeds the ability of an affected region to help itself and makes supra-regional or international assistance necessary (cited in Munich Re Group 2005, p. 12). Generally this is the case when there are thousands of fatalities, when hundreds of thousands of people are made homeless, or when economic losses – depending on the economic circumstances of the country concerned – and/or insured losses reach exceptional extents. Population growth and gross socioeconomic inequities between rich and poor countries, which lead to an over-exploitation of natural resources. Global climate change, which in long term result in earth warming and an increasing ocean level. According to the World Urbanization Prospects 2005, a current database from the United Nations Department of Economic and Social Affairs, the total population will increase from 6.4 billion in 2005 to 8.2 billion in 2030. Most of the expected population growth will be concentrated in the urban agglomerations of the less developed countries. By 2007, for the first time in human history, more than half the people in the world will be living in cities. The development with regard to observed increase in global warming is not less fast and dramatic. According to the Third Assessment Report (TAR) of the Intergovernmental Panel on Climate Change (IPCC), the global average surface temperature has increased by about 0.6°C over the 20th century. The report analyzes that the average surface temperature is projected to increase by 1.4 to 5.8°C over the period 1990 to 2100, and the sea level is projected to rise by 0.1 to 0.9 metres over the same period (IPCC 2001). A large interdependency can be determined between these two described causes. It is difficult to say whether the increase in disasters is related to climate change, or the fact that population growth increase the number of people affected by disasters. The increase of population and consumption has reached unsustainable levels and leads to a loss of biodiversity and rising imbalance between protection and use of natural resources. This overall intensification of natural resource utilization increases the environmental degradation and decay of the key ecosystems (land degradation, erosion, deforestation, air, water, and soil pollution). The urban growth leads to an increase in vulnerability of major metropolitan areas to disasters. Primarily the uncontrolled and uncoordinated urban growth causes a lot of different ecological, economic and social problems and risks. Considering the high density and the large number of inhabitants combined with the accelerated urban development, especially so-called megacities and urban agglomerations run highest risk in cases of natural and human-caused disasters (cf. Kötter/Friesecke 2005). It is expected that the vulnerability of the society and the human environment as well as the threat by disasters will intensify continuously in the future. On December 26, 2004, South Asia was hit by one of the most devastating natural catastrophes of recent decades. The largest earthquake since 1964 caused devastating tsunami waves that killed nearly 230.000 people in Indonesia, Sri Lanka, South India, Thailand and the Maldives, making it one of the most deadly catastrophes in modern history. 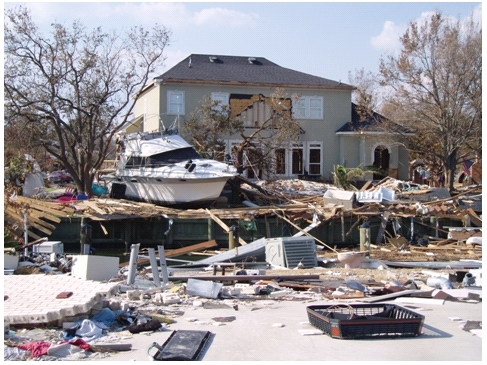 Hurricane Katrina was a tropical cyclone that hit the southern States of America in August 2005 and was the most destructive and costliest natural disaster in the history of the United States. After landfall on August 29, several sections of the levee system of New Orleans collapsed so that up to 80% of the city was underwater. Experts estimate a total economic damage of over $ 75 billion. Besides smaller-scale disasters, especially these two catastrophic events provide dramatic evidence of what nature’s power is capable of. In the past decades, the damage due to natural and “un-natural” (or human-made) disasters increased worldwide in amount and magnitude. 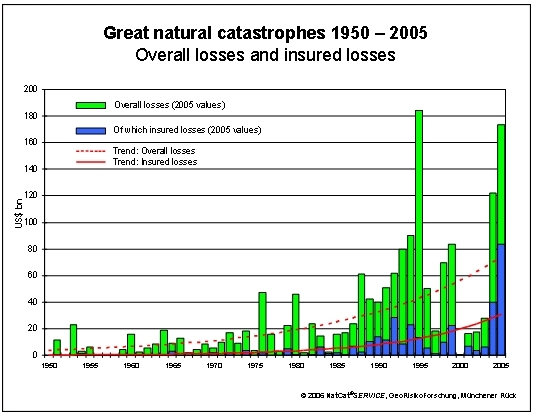 Figure 1 shows the economic losses and insured losses of major disasters during the second half of the twentieth century up to now. According to investigations of the reinsurance agency Munich Re the economic losses exceeded over 145 billion US $ in the year 2004, whereby the trend took a progressive process in the last years (Munich Re Group 2005). In 2005, there was an 18 per cent rise in disasters that killed 91,900 people according to official figures issued by the Centre for Research on the Epidemiology of Disasters (CRED) and the United Nations International Strategy for Disaster Reduction (UN/ISDR) in Geneva (UN Press Release January 30, 2006). Until the year 2050 the number of fatalities by natural catastrophes will increase up to an average of 100.000 persons per year; at the same time an increase of the annual economic losses up to 300 billion US $ is expected (Munich Re 2003). Alone the number of people worldwide vulnerable to a devastating flood is expected to grow to 2 billion by 2050 due to climate change, deforestation, rising sea levels and population growth in flood-prone lands, warn experts at the United Nations University (UNU-EHS News Release June 13, 2004). It is obvious that the major part of the damage will take place in developing countries with a dramatic impact on poor people and ethnic minorities. Countries with low human development account for 53 percent of recorded deaths from disasters even though they are home to only 11 percent of the people exposed to natural hazards worldwide (UNDP 2004, p.10). The serious impacts on the global environment show that there is an urgent need for more and better urban development strategies for disaster risk assessment and risk reduction. Instead of starting with the focus on natural hazards and their quantification, the assessment and ranking of the vulnerability of affected groups should serve as the starting point in defining priorities and remedial interventions. Due to the increasing frequency of disasters worldwide, a lot of international organizations, governments and NGOs like FIG are upgrading the priority of disaster risk management for policy, and are developing techniques and tools for disaster mitigation, rehabilitation and reconstruction. 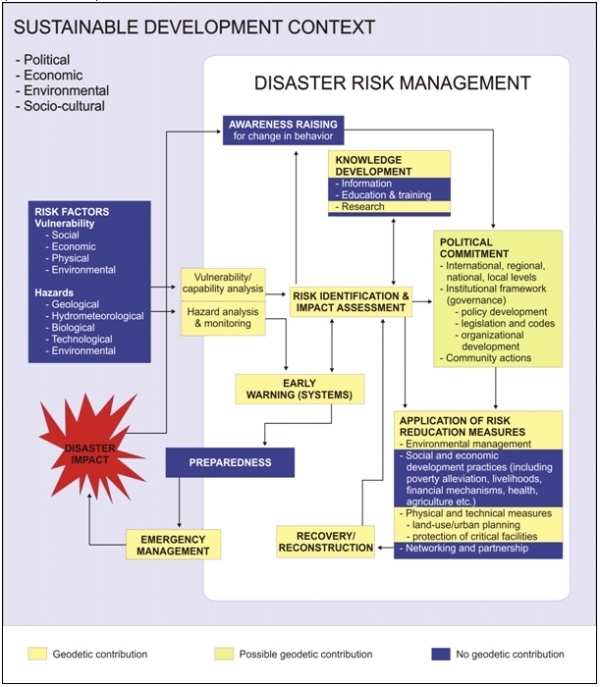 According to ISDR Secretariat disaster risk management means the systematic process of using administrative decisions, organization, operational skills and capacities to implement policies, strategies and coping capacities of the society and communities to lessen the impacts of natural hazards and related environmental and technological disasters. This comprises all forms of activities, including structural and non-structural measures to avoid (prevention) or to limit (mitigation and preparedness) adverse effects of hazards (cf. UN/ISDR 2004 and www.unisdr.org). Based on the above specified components, disaster risk management includes measures before (risk analysis, prevention, preparedness), during (emergency aid) and after a disaster (reconstruction). Sometimes disaster risk management includes only a part of disaster management, focusing on the before of the extreme natural event (cf. GTZ 2004, p. 18). However, each risk reduction measure has to be evaluated regarding its technical functionality, economic costs and efficiency as well as social and ecological effects (ESPON 2005). In the context of disaster risk management, various activities and initiatives at national and international level show the increasing relevance of disaster reduction, e.g. the United Nations International Strategy for Disaster Reduction (ISDR) as well as the Centre for Research on the Epidemiology of Disasters (CRED). The joint aim of all activities is to reduce the risk of social, economic and environmental impacts of natural hazards on vulnerable populations, within the broad context of sustainable development. In addition, the United Nations Conference on Environment and Development, Rio de Janeiro (1992), the Millennium Development Goals (2000), the World Summit on Sustainable Development, Johannesburg (2002) and the World Conference on Disaster Reduction, Kobe (2005) have promoted improved linkages between sustainable development and disaster risk reduction. Besides the implementation of case studies, priority was given to create comprehensive guidelines that could be used by governments, international (partly non-governmental) organizations and society to help avert losses from natural and technological disasters. However, as the latest disasters have clearly illustrated, more than ever a holistic approach to disaster risk management is needed in order to enhance resilience and reducing vulnerability to disasters. Scientists and engineers can contribute to this major challenge for disaster reduction by continuing and intensifying research on the natural processes and creating new tools and models for all phases of a disaster. This includes for example the development of hazard mitigation strategies (e.g. sustainable land management) and data collection systems that provide real-time and high quality data for use in models for risk analysis, forecasting and early warning. The possible contribution of the surveying profession will be described in the following chapter. The modern surveyor can play an important role in the field of disaster risk management, although in most cases, the activities will take place as part of multi-disciplinary task forces. About 80 % of daily decisions on national or local level, either in economy, finances / taxation, demography, spatial planning, environment, hazard areas, infrastructure, housing, cultural heritage, etc. are spatially or geo-referenced. That demonstrates clearly, surveying is a central pillar of each country and its economy (Magel 2005). Roberge has a more sceptical view of the situations in which surveyors get involved concerning disaster risk management: “Our contribution is neither spectacular nor glamorous. We are not under the spotlight like rescue teams, policemen, doctors, etc. Nevertheless, our role is no less important but merely, too often, unknown or misunderstood” (Roberge 2005). As visualized in figure 4, there is an irreversible process of professional change in surveying methods and applications in the past decades. 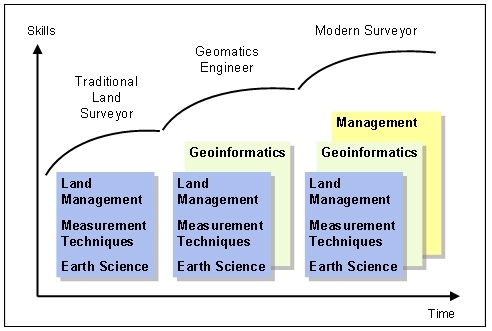 Whereas the surveyor in former times (only) had profound knowledge in areas of work such as Earth sciences, measurement techniques and land management, the modern surveyor needs also skills in (geo-)informatics and management. Requirements are not only engineering know-how but also knowledge in business administration (planning, organizing, leading, co-ordinating and controlling) as well as the development and management of databases of geo-data. The modern surveying engineer assists in acquiring, managing, visualizing and analyzing geospatial data related to disasters. 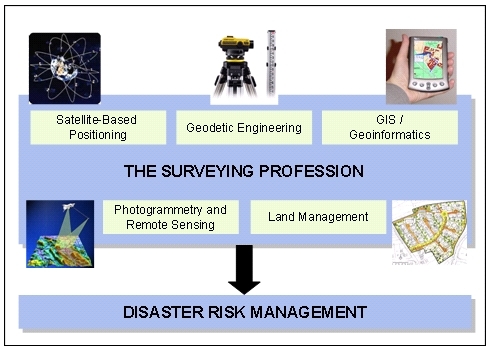 Combined with new technologies and methods, the challenging profession delivers the basic principles for disaster risk management within the disciplines geodetic engineering, satellite-based positioning, photogrammetry, remote sensing, geoinformatics and land management (fig. 5). However, the five geodetic disciplines listed in figure 5 have to be seen in close interrelationship. The key for success lies in the collaboration and networking between the different disciplines and techniques, e.g. because of the fact that geographic information systems use airborne and satellite data as well as radar and (multi-spectral) images. Of course, as already mentioned, not only the surveyor can contribute to the prevention and mitigation of disasters. The multi-sectoral and interdisciplinary approach to disaster reduction requires interaction, co-operation and partnerships among all related stakeholders and institutions (i.e. local authorities, civil society and private sector). Especially tools to monitor the risk evolution process are very important. Disaster reduction measures should be based on continuous assessment of vulnerability and hazards, including a vulnerability/hazard analysis and monitoring. Photogrammetry, for instance, is an efficient tool in the monitoring of spatial objects like volcanoes or mass movements with respect to location form and size (Altan 2005, p. 311). The surveyor as an expert in geoinformatics can support the first steps of the disaster risk management cycle, establishing geographic information systems for risk analysis, monitoring and early warning systems. Besides that, virtual 3D city models can provide important information in case of severe destruction of infrastructure to facilitate localization in indoor and outdoor navigation (Kolbe, Gröger, Plümer 2005). Furthermore, land use and urban planning can help to mitigate disasters and reduce risks by avoiding construction of settlements and key facilities in hazard prone areas, control of population density and expansion. In the post-disaster phase surveyors’ contribution of cadastral reconstruction to the redevelopment of the affected areas is needed. 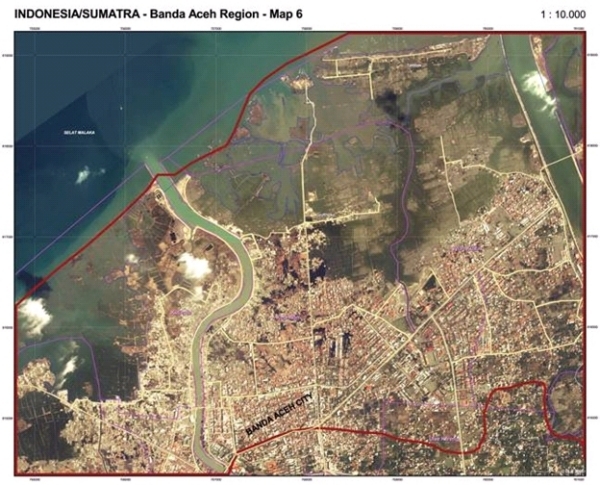 Haroen/Achmad/Rusmawar explain the new cadastral approaches after the tsunami and earthquake in Aceh (Haroen et al 2005). A surveyor as an urban planner can contribute to the rehabilitation of housing, infrastructure and public facilities and to reduce the future vulnerabilities of human settlements. The main focus of disaster risk management is often dedicated to monitoring of objects, areas, regions or even the whole earth with the aim to give warning to the people that may be affected by a disaster at right time. In general we talk about early warning systems. Early-warning-systems are essential for almost all natural and human-made disasters as mentioned in chapter 1.1. Exemplary catastrophes that are monitored and forecasted by geodetic means are mentioned in the following: earthquake, volcanic eruption, landslide, tsunami, dam or bridge failures. Obviously to build up early warning system one requires highly interdisciplinary teams: different scientists and engineers have to work together. If one is talking e.g. about tsunamis one needs geologists, geophysicists, hydrologists; to avoid bridge failures the knowledge of civil engineers is non refusable. But in parallel to all monitoring tasks is the need for geometric quantities in the sense e.g. of positions of objects in absolute sense or in relation to other objects or in distances between points on one object. To measure positions and other geometry related quantities a surveyor is needed to design, develop and implement the respective measurement systems as well as to evaluate and analyse the measured quantities. Therefore the knowledge of a geodetic engineer is non substitutable in any of the named early warning applications. coming to decision within the disaster risk management process in an interdisciplinary team. The measurement instruments used for early warning systems depend on the required quality especially the accuracy demands as well as to the extension and the environment of the monitored object, area or region. So for tasks as early warning with respect to tsunamis or volcanic eruptions large areas or regions are monitored. Here satellite based positioning methods are applied. For small extensions as valid for constructions like bridges or dams and for e.g. landslides higher accuracy is required, so that tacheometers as well as other specialised instruments like digital levels, tiltmeters or inclinometers are in use. For an overview we refer to Foppe et al. (2004). One typical example regarding early warning is the monitoring of slopes with respect to possible landslides. Regarding the behaviour of the slope one has to consider the landslide classification by the UNESCO Working Group for World Landslide Inventory (fig. 7) for the modelling as well as further information regarding the geological and tectonic background of the slope. For this we need interdisciplinary teams consisting of geodesists and geologists. One of the first projects dealing with interdisciplinary research work was the “Geotechnical Information System” in cooperation of geologists from the Geological Institute Mainz and geodesist from the Geodetic Institute Hannover (Foppe & Matthesius, 1994). The objective of the project was fast and precise monitoring of the actual state of the monitored slope. Different slopes in south Germany were investigated within this project. The geodetic as well as the geotechnical measurements were integrated in one information system that allows the analysis and interpretation of the results. The geodetic engineers were responsible for building up a Geotechnical Information System including data acquisition, management and deformation analysis. This interdisciplinary cooperation example has taken its continuation in several scientific projects as well as practical implementations leading to an integration of the geodetic engineer into landslide monitoring projects due to his knowledge about data acquisition, data processing and modelling of the likely sliding slope. As an example the new project InterRisk (Integrative Landslide Risk Analysis and Perception in the Swabian Alb) as cooperation between geologists, geographers and geodesists may be given. Here among other things the derivation of correlations between external factors like rain fall and geometric quantities, the measured deformations, are under research (e.g. InterRisk 2006, Schauerte et al. 2006). On a larger scale tsunami warning systems are currently of high interest. For example the GeoForschungsZentrum Potsdam (GFZ) will co-develop a part of the IOTWS (Indian Ocean Tsunami Warning System) near Indonesia. This development is a German-Indonesian cooperation called GITEWS (German Indonesian Tsunami Early Warning System) granted by the German government (BMBF 2004). 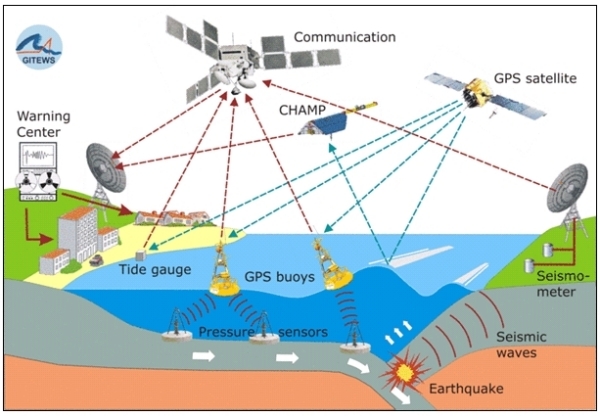 The system will integrate terrestrial observation techniques like seismometers and tide gauge measurements by GPS as well as marine measurements on GPS buoys and with ocean bottom pressure sensors and the processing centre in Indonesia (compare fig. 8). The base is the already available global earthquake monitoring system of GFZ and its also available real-time communication technique. Overall the system consists of four chain links: the data acquisition, the data processing, the validation and the warning component. The final implemented system will have an open and modular character to ensure the possibility to be further enlarged without problems. The development and implementation of the system is accompanied by capacity building in the sense of training of local scientists, engineers and decision makers in Indonesia regarding measurement techniques, tsunami modelling and information processing. In this way the technical objectives of the GITEWS are supplemented by additional efforts aiming to develop human skills to reduce the level of risk in Indonesia. The GITEWS team is highly interdisciplinary consisting of geophysicists, hydrologists, computer scientists and of course geodetic engineers. The positive fact is that the scientists and engineers of this project have already done research in the same organisation like GFZ before project start. This illustrates the importance of interdisciplinary research centres for activities regarding disaster risk management and especially early warning systems. Still surveyors are seen as supplier of measured geometric data. This has to be changed dramatically. The geodetic engineer has to be an equal partner within the discussions. Even more the surveyor may play in important part in the decision process, since in general he delivers the respective geometric information that is essential for releasing an alarm in any early warning system. In other words the geodetic measurements drive the emergency planning tasks thus steering the whole process of disaster risk management in case of an impending event. This leads to the conclusion that the surveyor should be one of the key decision makers in any monitoring and early warning team. Additionally the knowledge of surveyors regarding modelling of dynamic systems like construction or slopes should lead to an equal role for the evaluation and optimization of these dynamic models describing the behaviour of the monitored objects. In general the specialists that collaborate with the surveyors see any involvement into “their” objects and processes as a danger for their profession. This means that a civil engineer does not like discuss their dynamic construction models with geodesists and that geologists do the same with landslide models. We have to explain to our colleagues that a win-win situation is generated in case of shared knowledge. The interdisciplinary cooperation would be even more purposeful. Finally the assessment of risks would be possible with the help of geodesists in case of a real interdisciplinary cooperation. Photogrammetry is an efficient tool in monitoring spatial objects due to location, form and shape. Its main advantage to other measuring techniques lies in the fact that the measurement is done on the images and indirect measuring possibility opens the users of this method a wide range of application possibilities. One of the contributions is the use of terrestrial photogrammetric methods to determine the monitoring, documenting and analyzing the damages in the structures after an earthquake. Today with the help of digital data capturing, on-line processing techniques and automation of data evaluation by means of image analysis and matching techniques is enabled. In this context 3D-object reconstruction techniques, classification or image detection and their integration into a deformation analysis procedure using information system technology is used. So after a short time and nearly on-line the deformations of the building can be determined and obtained, the displacements values are controlled with the values given in the “Structural Codes”. With this very fast data acquisition technique the civil engineers gain an efficient tool to determine whether a damaged building will be kept for retrofitting or be demolished. Aerial photogrammetric data acquisition techniques give very accurate data about the damaged area and are a very good tool for coordinating rescue operations after a disaster. The data gaining method named as LIDAR (= LIght Detection And Ranging) is a weather and day light independent method which provides data very fast and enables to detect the damaged parts of a city or residential areas automatically. Earth observation satellites have demonstrated their utility in providing data for a wide range of applications in disaster risk management. Pre-disaster uses include risk analysis and mapping; disaster warning, such as cyclone tracking, drought monitoring, the extent of damage due to volcanic eruptions, oil spills, forest fires and the spread of desertification; and disaster assessment, including flood monitoring and assessment, estimation of crop and forestry damages, and monitoring of land use/change in the aftermath of disasters. Remotely sensed data also provide a historical database from which hazard maps can be compiled, indicating which areas are potentially vulnerable. Information from satellites is often combined with other relevant data in geographic information systems (GIS) in order to carry out risk analysis and assessment. GIS can be used to model various hazard and risk scenarios for the future planning and the development of an area. A proposed concept of a geo-space system for prediction and monitoring earthquakes and other natural and man-made catastrophes, which is based on a system capable of monitoring precursors of earthquakes in the ionosphere and magnetosphere of the Earth and using these precursors to make short-term forecast of earthquakes. Investigations on the interaction between ionosphere’s F layer variations and different variations occurring in circumterrestrial environment (atmosphere, ionosphere and magnetosphere) associated with seismic activity, and detected by means of ground base and satellite monitoring. This method and others like GPS measurements for long distances are providing useful parameters for earthquake forecasting. Realizing the fact that the remotely sensed data can help very much for the disaster risk management, at its forty-fourth session, the Committee on the Peaceful Uses of Outer Space agreed to establish action teams composed of interested Member States in order to implement the recommendations of the Third United Nations Conference on the Exploration and Peaceful Uses of Outer Space (UNISPACE III). One of the action teams focused on studying and recommending the implementation of an integrated operational global system, especially through international cooperation, to manage natural disaster mitigation, relief and prevention efforts through Earth observation, communications and other space-related services, making maximum use of existing capabilities and filling gaps in worldwide coverage. Several UN Member States expressed their support for the work being carried out by the action team, emphasizing the importance of creating an entity (DIMISCO; Disaster Management International Space Coordination Organization) in that it could promote more effectively the application of space technology in disaster reduction and management at the global level, and in developing countries in particular, and their preference of setting up such an entity under the umbrella of the United Nations in order to guarantee universal access. It is planned that the proposed entity will be operational on 1 January 2007. Spatial Data Information is one of the core subjects in disaster prevention and emergency aid. To guarantee, e.g., for speed and efficiency of rescue operations all information should be available at a glance in the control units and in the mobile rescue units as well. In an emergency case, not only the location of the event but many other information is needed, like ‚How many people are affected?‘, ‚Which road network is available?‘, ‚Can the location be reached by vehicles?‘ ‚Where are the most nearby hospitals located?‘ ‚How much and which kind of capacity do the hospitals have?‘ Such and many other questions can be answered very quickly if and only if reliable spatial data are available in digital form and if the data are processed in a powerful Geo Information System (GIS). Recently, many IT developments took place which can help to speed up the information flow considerably. The availability of Internet access points, the widely common IT infrastructure within the Internet, the standardisation process defining spatial data processing procedures all together provide for the IT base of a spatial data infrastructure to support a powerful spatial information management which can be used as a valuable source of suitable disaster management. The spatial data infrastructure should be consistently implemented across sub-national and national boundaries because disaster areas typically do not coincide with administration boundaries. Geo Information Systems can help to support all phases of emergency management, like mitigation, preparedness, response and even recovery. Traditional skills of a surveyor, like quality awareness, are a valuable contribution and can help to support the quality assurance of spatial data and of spatial information processes as well. Spatial data processing needs the data management capabilities of surveyors. In the field of land information systems, surveyors possess a sound experience in maintaining huge spatial databases at a very high level of reliability since a long time. This knowledge can be used to support the implementation of other but, technically spoken, similar spatial information systems which provide for an absolutely indispensable base for the effective disaster risk management. 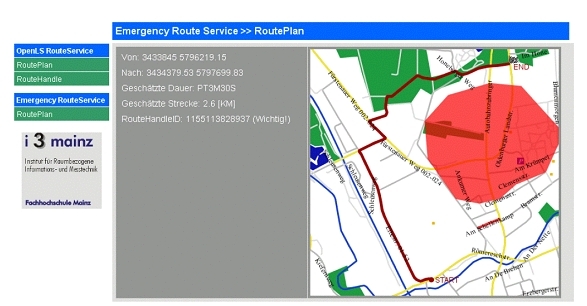 The given figures show a prototype of how to request and receive an automatic access route generation via Internet under the conditions of an upcoming emergency case. The syntax of such a request is given in GML notation, the result obtained by the request is shown as a computer screen shot. Land is an ultimate natural resource, without it life on earth cannot be sustained. As a result of the dramatic increase in population growth and poverty especially in the developing countries, people increasingly settle and farm in disaster-prone areas, where land is often more fertile in comparison to other locations. The consequences are dramatic: A great number of people are vulnerable to extreme natural events due to a lack of land use planning. In the context of disaster risk management effective land management and land use planning can help to mitigate disasters and reduce risks by avoiding human settlements in hazard prone areas, control of population density and expansion. Land development (implementing utilities, infrastructure and construction planning). Engineering measures and construction of hazard-resistant and/or protective structures and infrastructure. Economic viability through decentralized development with a poly-centric settlement structure (cf. Kötter 2003). As described above, an integrative and comprehensive approach of methods for disaster reduction on the one hand and the strategies of land use planning and land management on the other hand is missing so far. 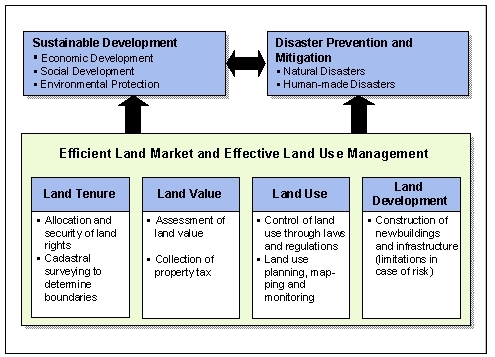 Improved land use and land management strategies and instruments are needed that combine the land administration/cadastre/land development function with the process of disaster risk management. Therefore, especially security of land tenure, access to land and control of land use in hazard-prone areas are central issues to minimize vulnerability of populations to future crisis and disasters. This includes creation and adoption of a comprehensive policy on land management with regard to disaster prevention and mitigation as well as sustainable development (cf. figure 11). However, the first steps in achieving these goals have been taken. Institutional and public awareness is increasing. The implementation of sustainable land management will help to promote economic and social development in both urban and rural areas and will lead to a better disaster reduction. Whereas current disaster management strategies tend to favour structural measures (engineering solutions), one can notice a change of paradigm towards non-structural measures such as land use and building regulations or special disaster legislation. Concerning flood prevention, for example, the key objective is to leave more room for rivers, particularly for their natural flood plains, or to give the space back to them. To achieve this goal, measures for moving dikes further away from river banks as well as conservation or restoration of flood plains have to be implemented in the flood protection strategies. This includes certain restrictions on the construction of buildings in areas classified as “at risk of flooding” and agricultural use in high-risk areas (Friesecke 2004). undertakes damage assessment of the destroyed or harmed buildings and public facilities in the aftermath of a disaster. However, it’s not the surveyor alone, who contributes to disaster risk management with special regard to land management. Land management and land use planning are interdisciplinary tasks that shift the responsibility for the described strategies and measures on various occupational groups. Land consolidation can be an effective instrument in rural development for preventative risk reduction. On the one hand, it can facilitate the creation of competitive agricultural production arrangements by enabling farmers to have farms with fewer parcels that are larger and better shaped, and to expand the size of their property. But, on the other hand, because of the growing importance of flood protection, land consolidation has become an increasingly important instrument in increasing water storage capacity, redeveloping flood plains and renaturalizing rivers. There is a growing realization that the above mentioned flood mitigation measures must be combined in an integrated approach to flood disaster management. A balance between structural and non-structural measures to manage floods is required, where the main focus is shifting from large structural solutions to non-structural approaches such as avoiding building development in flood plains. In particular GIS, GPS and the digital data transfer may importantly contribute to simplifying work and to shorten the land consolidation procedure. It is safe to say that the share of Surveyors during this process results in a more cost-effective land consolidation! (cf. for more information Friesecke 2005). To be a good technician it is not enough to be a good technician only. 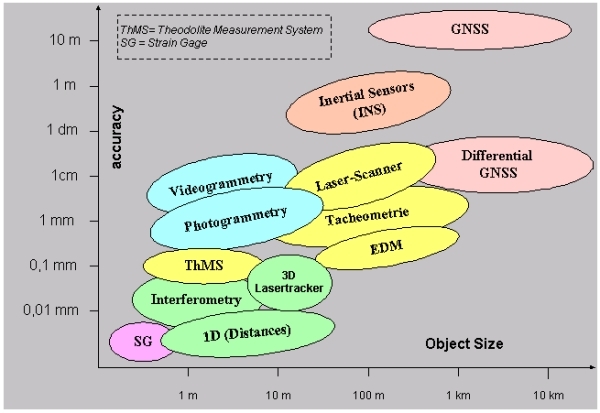 The modern surveyor is confronted with the introduction of new and enhanced technology including scanning technology, both terrestrial and airborne, sensor technology, GIS developments, the development of satellite navigation systems (GPS/GLONASS) as well as the implementation of space missions for Earth observation (e.g. CHAMP/GRACE). Risk analysis and assessment: mathematical-statistical analysis using geospatial data (airborne and satellite data; radar and multi-spectral images); detecting and quantifying land cover and land use change for hazard analysis and monitoring (e.g. by remote sensing); usage of GIS in hazard mapping. Knowledge development: research in disaster reduction and disaster control, e.g. research of the earth’s shape, sea level changes, gravity field and plate tectonics. (Precautionary) disaster risk reduction measures: Land management; development of land use concepts; deformation measurements for volcano or mass movement monitoring; engineering surveys and monitoring of structural measures (e.g. dams, dikes). Early warning: Technologies and techniques for early warning systems, e.g. data acquisition and analysis; software development; cartographic visualization; disaster modelling; usage of geodetic control networks. Emergency management: use of virtual 3D models of towns, buildings and landscape for an easier location in case of a disaster (evacuation and emergency planning); supply of digital maps for emergency planning, mobile mapping. Recovery/Reconstruction: documentation of damages (by laser scanning or tacheometry); damage assessment of the destroyed or harmed buildings and public facilities; cadastral reconstruction. 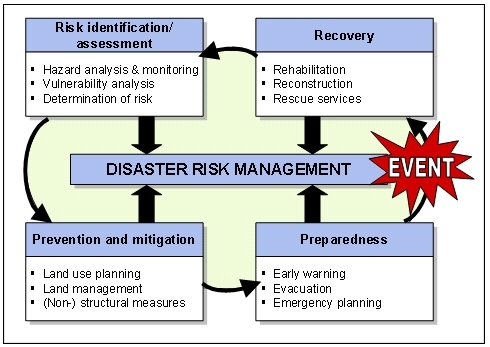 As the above specified fields of activity and the good-practice-examples in the last sections show, the whole scope of surveyor’s abilities can make an important contribution to improve the disaster risk management procedure, including methods and measures before (risk analysis, prevention, preparedness), during (emergency planning) and after a disaster (reconstruction). In conclusion, the contribution of the surveying profession in disaster risk reduction results in a more effective and efficient disaster risk reduction! Unmistakably, the surveying profession is in a period of unprecedented change. Traditional measurement instruments and tools are and will be supplemented or displaced by automated devices, new satellite navigation systems (e.g. European system GALILEO), digital remote sensing sensors as well as new space missions for Earth observation (e.g. GOCE). This trend to the formation of new technologies and, closely connected with that, new fields of professional activity will continue in the near future. To be able to manage the new and complex challenges, well-skilled experts are needed against the background of unresolved problems like population growth and increasing disaster risk. These new developments require an appropriate mixture of broad knowledge and specialized expertise. According to Magel (2003), a surveyor should become a »well grounded specialized generalist« with more business skills and knowledge and the intention of more inter- and intradisciplinary collaboration in the future. 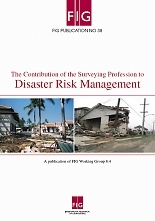 To give an example with regard to disaster risk management, an important contribution of the surveying profession can be made by political commitment and institutional development (good governance to elevate disaster risk reduction as a policy priority, integration in development planning and sectoral policies, implementing organizational structures, legal and regulatory framework). If we succeed in these priorities there is a great chance that the surveying profession will have an even more prosperous future in the upcoming years. in eradicating poverty and promoting development. A comprehensive response to natural and human-made disasters is often constrained by institutional fragmentation and organizational deficiencies. In order to create a healthy environment for future generations, especially good governance and capacity building are two areas that need to be established globally to be effective tools for disaster reduction. Governance is seen by the United Nations as the process of decision-making and the process by which decisions are implemented (or not implemented). It brings together the actions of several actors at all levels, including government, ministries, international organizations, NGOs, research institutes, universities and finance institutions. Certainly, government is the dominant actor in moving towards sustainable development and disaster risk management, but also the private sector and civil society are playing an ever more active role in successful disaster risk reduction. It is being increasingly recognized that disaster risk management at the local level is a key element in any viable national strategy to reduce disaster risk (cf. UNDP 2004, p. 76). In connection with this, the issue of decentralization poses an important institutional challenge. Decentralizing the leadership and authority of disaster risk management to the regional or municipal level encourages local participation and engages people to volunteer based on their own self-interest and community well being. According to Dr. Janos Bogardi, Director of the Institute for Human Security and Environment (UNU-EHS), especially participatory approaches where people at risk can take part and effectively contribute to disaster reduction efforts are one area that needs more attention and development. Besides the aspect of participation, the other characteristics of good governance — rule of law, transparency, responsiveness, consensus orientation, equity, effectiveness, efficiency, accountability and strategic vision — are a precondition for sustainable development and effective disaster risk reduction (cf. Magel/Wehrmann 2001). In addition, good governance can be seen as an effective instrument for poverty alleviation and to achieve the UN Millennium Development Goals. The ISDR Secretariat of the United Nations defines capacity building as the efforts aimed to develop human skills or societal infrastructures within a community or organization needed to reduce the level of risk (UN/ISDR 2004, Annex 1). In the context of disaster risk reduction, capacity building can be achieved through disaster management training and education, public information on disasters, the transfer, provision or access to technology or other forms of technical assistance intended to improve institutional efficiency. The concept also relates to the training of disaster managers, the transfer of technical expertise, the dissemination of traditional knowledge, strengthening infrastructure and enhancing organizational abilities (UN/ISDR 2004, S. 246). Major disaster events in recent years, for example the 2004 Indian Ocean earthquake as described in section 1.2, have shown the need for greater education and information in disaster risk management. In these relatively poor parts of the world, especially setting up the communications infrastructure to issue early warnings is a big problem. To achieve improvements concerning this goal, the process of capacity development should be addressed at all levels and all sectors (cf. also FIG 2004, p. 25f.). In the 21st century, the key issues in capacity-building efforts are strengthening the legal and organizational capabilities of institutions in charge of disaster risk management and networking between them. Figure 13 summarizes good governance and capacity building as a central component regarding the process and implementation of disaster risk management and sustainable development. Altan, Orhan (2005): Use of Photogrammetry, Remote Sensing and Spatial Information Technologies in Disaster Management, especially Earthquakes, in: Van Osterom, Peter; Zlatanova, Siyka; Fendel, Elfriede M. (editors) (2005): Geo-information for Disaster Management. Springer Berlin Heidelberg New York 2005, p. 311-322. BMBF (2004): Aufbau eines Tsunami-Frühwarnsystems im Indischen Ozean, der deutsch-indonesische Beitrag. Bundesministerium für Bildung und Forschung (Federal Ministry of Education and Research), Bonn / Berlin, 2004. Deutsche Gesellschaft für Technische Zusammenarbeit (GTZ) (2004): Guidelines. Risk Analysis – a Basis for Disaster Risk Management. Eschborn, June 2004. Enemark, Stig (2004): Building Land Information Policies. Proceedings of Special Forum on Building Land Information Policies in the Americas. Aguascalientes, Mexico, October 26-27, 2004. 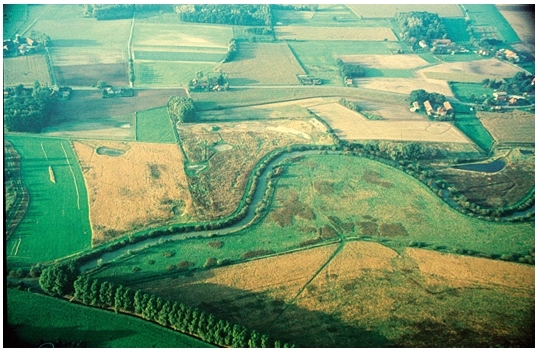 Enemark, Stig (2005): Land Management and Development. CLGE International Conference 2005, Brussels/Belgium, 1-2 December 2005. ESPON Monitoring Committee (2005): The Spatial Effects and Management of Natural and Technological Hazards in Europe. European Spatial Observation Network (ESPON 2006) Project 1.3.1., 2005. European Environment Agency (EEA) (2006): Multilingual Environment Glossary. http://glossary.eea.europa.eu/EEAGlossary. FIG (2004): Marrakech Declaration - Urban-Rural Interrelationship for Sustainable Development. Copenhagen, Denmark, FIG Publication No.33, ISBN 87-90907-32-9. www.fig.net/pub/figpub/pub33/figpub33.htm. FIG (2005): Aguascalientes Statement – The Inter-Regional Special Forum on Development of Land Information Policies in the Americas. Aguascalientes, Mexico, FIG Publication No.34, ISBN 87-90907-41-8. www.fig.net/pub/figpub/pub34/figpub34.pdf. Foppe, K., Matthesius, H.-J. (1994): Abschlussbericht zum DFG-Projekt “Geotechnisches Informationssystem” (Final Report on Project „Geotechnical Information System“). Wiss. Arbeiten der Fachrichtung Vermessungswesen der Universität Hannover, Heft 228, 1998. Foppe, K., Schwieger, V. (2000): Monitoring and Modelling of Landslides – State of the Art and New Trends. Proceedings on Symposium “Present Problems in Geodesy and Cartography”, Wroclav, Poland, 2000. Foppe, K., Schwieger, V., Staiger, R. (2004): Grundlagen kinematischer Mess- und Auswertetechniken. Kinematische Messmethoden, DVW Schriftenreihe 45, Stuttgart, February 17-18, 2004. Friesecke, Frank (2004): Precautionary and Sustainable Flood Protection in Germany – Strategies and Instruments of Spatial Planning, 3rd FIG Regional Conference, Jakarta, Indonesia, October 3-7, 2004. Friesecke, Frank (2005): Flood Risk Management – Flood Prevention by Land Consolidation in the Rhine Catchment Area, FIG Working Week 2005 and GSDI-8 Cairo, Egypt, April 16-21, 2005. German Association of Surveying (Deutscher Verein für Vermessungswesen e.V.) (DVW) (2005): Surveying. A profession with new opportunities in geodesy, geo-information and land management. 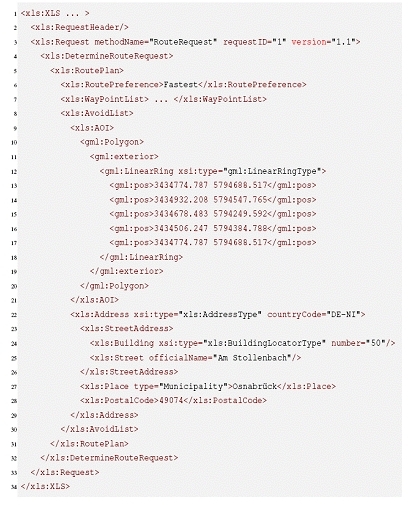 www.dvw.de/UserFiles/File/2_beruf/beruf.pdf. GFZ (2006): Web-Page of GeoForschungsZentrum Potsdam. http://www.gitews.org/ 2006. Haroen, Tony S.; Achmad, Chairul B.; Rusmawar, Wenny (2005): Cadastral Reconstruction in Aceh: A Newborn Concept of Adjudication. South East Survey Congress in Bandar Seri Begawan, Brunei Darussalam, November 21-25, 2005. Intergovernmental Panel on Climate Change (IPCC) (2001): Third Assessment Report (TAR) – Climate Change 2001. InterRisk (2006): Web-Page of Project InterRisk. http://www.giub.uni-bonn.de/sozgeo/interrisk/index.html, 2006. Kolbe, Thomas H.; Gröger, Gerhard; Plümer, Lutz (2005): CityGML: Interoperable Access to 3D City Models, in: Van Osterom, Peter; Zlatanova, Siyka; Fendel, Elfriede M. (editors) (2005): Geo-information for Disaster Management. Springer Berlin Heidelberg New York 2005, p. 883-899. Kötter, Theo (2003): Prevention of Environmental Disasters by Spatial Planning and Land Management, 2nd FIG Regional Conference, Marrakesh, Morocco, December 2-5, 2003. Kötter, Theo (2004): Disaster Management and e-land Management. In: GIM International, November 2004, p. 12-15. Kötter, Theo; Friesecke, Frank; (2005): Urbanisation and Megacities – The Challenge of the 21st Century, The 6th Open Meeting of the Human Dimensions of Global Environmental Change Research Community, University of Bonn, Germany 9-13 October, 2005. Magel, Holger (2003): Bridging the Gap: About Integrating Survey and GIS, Opening Speech at the ESRI “Survey and GIS Summit - Bridging the Gap 2003”, San Diego, July 6, 2003. Magel, Holger (2005): About Surveyors’ Commitment, Role and Education for Society and Sustainable Development, Keynote Address at the Opening Ceremony of the 8th SEASC 2005 on November 22, 2005 in Bandar Seri Begawan, Brunei Darussalam. Magel, Holger (2006): Promoting Land Administration and Good Governance, Keynote address and Opening of the 5th FIG Regional Conference in Accra, Ghana, March 8-11, 2006. Munich Re Group (2006): Topics Geo Annual review: Natural catastrophes 2005. Knowledge Series, Munich 2006. Renner, Michael; Zoё, Chafe (2006): Turning Disasters into Peacemaking Opportunities, in: Worldwatch Institute (2006): The State of the World 2006, Washington D.C., p. 115-133. Roberge, Daniel (2005): After the Tsunami – How the Surveying Profession Can Participate in the Reconstruction, FIG Working Week and GSDI-8 Conference in Cairo, Egypt, April 16-21, 2005. Schauerte, W., Bell, R., Glade, T., Kuhlmann, H. (2006): Deformation Measurements of Landslides in the Swabian Alb within the Research Project InterRisk. Proceedings on 3rd IAG Symposium on Geodesy for Geotechnical and Structural Engineering and 12th FIG Symposium on Deformation Measurements, Baden, Austria, 2006. Schulte, Karl-Werner (2005): Geomatics in the Context of Real Estate. CLGE International Conference 2005, Brussels/Belgium, 1-2 December 2005. United Nations Development Programme, Bureau for Crisis Prevention and Recovery (UNDP/BCPR) (2004): Reducing Disaster Risk. A Challenge for Development. A global report, New York 2004. United Nations and Economic Commission for Europe (UN/ECE) (1996): Land Administration Guidelines, New York and Geneva. United Nations and Economic Commission for Europe (UN/ECE) (2000): Guidelines on Sustainable Flood Protection. 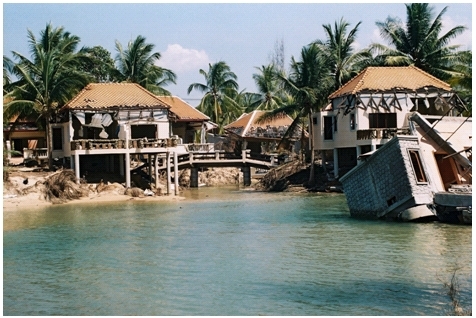 http://www.unisdr.org/eng/library/isdr-publication/flood-guidelines/Guidelines-for-reducing-floods-losses.pdf. United Nations Inter-Agency Secretariat of the International Strategy for Disaster Reduction (UN/ISDR) (2004): Living with Risk: A global review of disaster reduction initiatives. United Nations, Geneva 2004. United Nations Population Division (2005): World Urbanization Prospects: The 2005 Revision Population Database, http://esa.un.org/unup/. Wisner, Ben; Blaikie, Piers; Cannon, Terry; Davis, Ian (2004): At Risk. Natural hazards, people’s vulnerability and disasters. Second Edition 2004, Routledge New York.